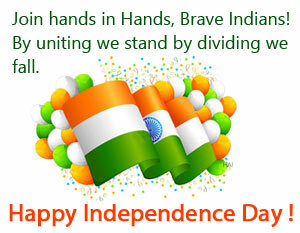 Independence Day of India celebrated on 15th August is the time to wish our friends and relatives. Check out best SMS and messages for wishing Happy Independence Day. Independence Day Messages - Independence Day of India celebrated on 15th August annually holds deep patriotic feeling in the heart of every Indian. The day witnesses great enthusiasm and fun across the entire nation. People greet each other with warm wishes and messages. Sending messages to friends, relatives, and co-worker on Independence Day has become very popular with increase of smart phone users in India. This section features a great collection of Happy Independence Day sms and messages. Y not its her 70th Birthday. Join hands in Hands,Brave Indians! By uniting we stand by dividing we fall. Open your minds and feel the freedom...Happy Independence Day! How can we forget the Tricolor Flag of our Loving India which winds up Very High! Let's salute and honor this. On Independence Day,Here's wising our dreams of a new tomorrow come true for us...NOW AND ALWAYS!